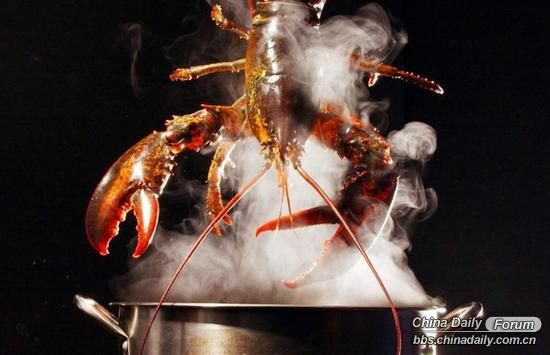 Chinadaily Forum › BBS › Life in China › Q&A › Is it cruel to boil lobsters live? (Xinhua) The Swiss government is to ban the common practice in restaurants of boiling live lobsters as part of an overall animal protection reform, Swiss media reported Thursday. "Live crustaceans, including lobster, may no longer be transported on ice or in ice water," the government said, explaining the new addition to the animal welfare law. "Aquatic species must always be kept in their natural environment. Crustaceans must now be stunned before they are killed," states the new law which will take effect in March, Swiss news agency SDA reported. The cabinet statement said it must be assumed that these animals are sentient and therefore must not be allowed to suffer unnecessarily. A similar law came into effect in neighboring Italy recently, Swissinfo reported. But not all Swiss agree with the government on its new ban. "Do they suffer?" the French-language daily Le Matin asked on Thursday. "We doubt it," it said with a picture of a juicy red cooked lobster on its page. The new law also strengthens the protection of dogs by cracking down on illegal puppy farms and outlawing automatic devices that punish dogs for barking. Unless you've bought a frozen lobster, what you brought home from the market is alive and kicking! So should you just put the lobsters into the large pot of boiling water? Or is that cruel? What is a humane way to cook lobsters?